The Hiroshima Prefecture is located in central Japan, in the Chugoku region of Honshu. 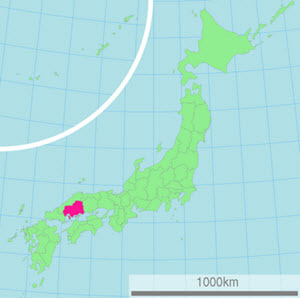 Most of the prefecture is mountainous, but there are also coastal plains toward the Hiroshima Bay area. This bay is a part of the Seto Inland Sea, and the Hiroshima Prefecture includes several small islands. The capital of the prefecture is Hiroshima (Hiroshima-shi), which is home to roughly 1.2 million of the prefecture’s residents. On August 6, 1945, it became the first city in history targeted by a nuclear weapon, as the U.S. Army Air Forces dropped an atomic bomb on the city toward the end of World War II. During the war, Japan’s Second General Army and the Chugoku Regional Army were headquartered in Hiroshima, and the Japanese Army Marine Headquarters were in Hiroshima’s Ujina port. The city was also an important shipping centre and held large quantities of military supplies. Today, Hiroshima is one of Japan’s top tourist destinations and receives several hundred thousand visitors each year. A study from 2012 showed that a majority of the foreign visitors were from the United States, followed by Australia and China. The sacred Itsukushima Island, also known as Miyajima, where many temples and shrines are located. This is a UNESCO World Heritage. Hiroshima Peace Memorial and Peace Memorial Park. The Hiroshima Peace Memorial is an UNSECO World Heritage. The park contains a large collection of monuments, including the Children’s Peace Monument and the Hiroshima National Peace Memorial Hall for the Atomic Bomb Victims. The Hiroshima International Animation Festival, a biennial festival founded in 1985, is one of the most renowned animation festivals worldwide. Since 1990, the festival is held in even years. The focal point for the event is Aste Plaza in central Hiroshima City. Unlike most other Japanese cities, Hiroshima City sill has an extensive streetcar (tram) network that hasn’t been replaced by subways and buses. Approximately 300 streetcars are in use here, which is more than in any other Japanese city. Streetcars have been transporting people in this city since 1912. After the 1945 bombing, the service between Koi/Nishi Hiroshima and Tenma-cho was up and running again within tree days. The streetcars 651 and 652 survived the atomic blast and are still in use today. The streetcar network in Hiroshima City also utilizes a some interesting old streetcars from Kyoto and Fukuoka, because when those cities scrapped their tram networks the city of Hiroshima bought the streetcars. This island is home to the a the famous Itsukushima Shrine, also known as Miyajima. During high-water, the shrine and its famous torii gate appear to the be floating. The shrine is dedicated to the three daughters of Susano-o no Mikoto, the Shinto god of seas and storms. The site is an UNESCO World Heritage, and several parts of it has also been designated National Treasures by the Japanese authorities. Administratively, the island is a part of the City of Hatsukaichi. According to ancient beliefs, births and deaths could spoil the spiritual purity of the island. Pregnant women are expected to avoid the island near their due date, and terminally ill people nearing end of life are expected to retreated to the mainland as to avoid dying on Itsukushima. No births or deaths have been recorded here since 1878. Burials on the island are not permitted.